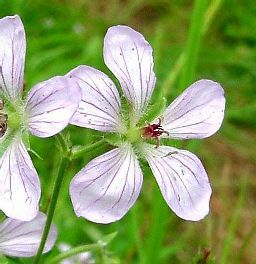 Does Geranium richardsonii Exist In Southern California? 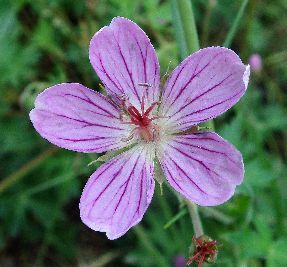 This page is directed to an audience of one: Dr. Carlos Aedo, the world expert on the Geraniums of North America, to give him more information about the Geraniums of the San Bernardino Mountains, to help him evaluate whether Geranium richardsonii exists there or not. This page will be revised after Dr. Aedo reaches his conclusion on this subject. 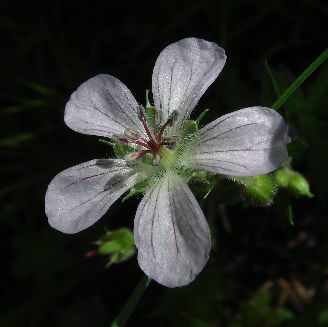 Geranium richardsonii and G. californicum are similar species that have always been difficult to separate. 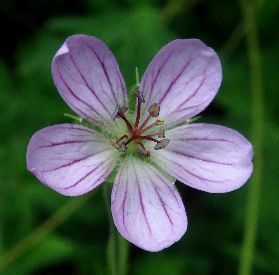 Carlos Aedo published a monograph on the perennial Geranium species of North America in 2001, and has detailed a number of characteristics that usually separate these two species. Nonetheless, there is still significant overlap in these two species, and some vouchers are hard to determine reliably since a key characteristic, the hairiness of the nectaries, is often obscured in pressed specimens. Aedo redetermined many specimens formerly called "G. richardsonii" as G. californicum. As a result, every specimen from southern California determined by Aedo is now G. californicum, with the exception of a single specimen from Bear Valley in the San Bernardino Mountains determined as G. richardsonii. There are four other vouchers from Bear Valley and nearby locations determined by Aedo as G. californicum. Thus either the two species coexist in that single location in southern California, or else the single voucher determined as G. richardsonii was one of the hard to determine vouchers, and is actually G. californicum. To investigate this issue, we searched six different locations in Bear Valley and nearby areas for any specimen of G. richardsonii. All plants we found are G. californicum, determined using Aedo's key. 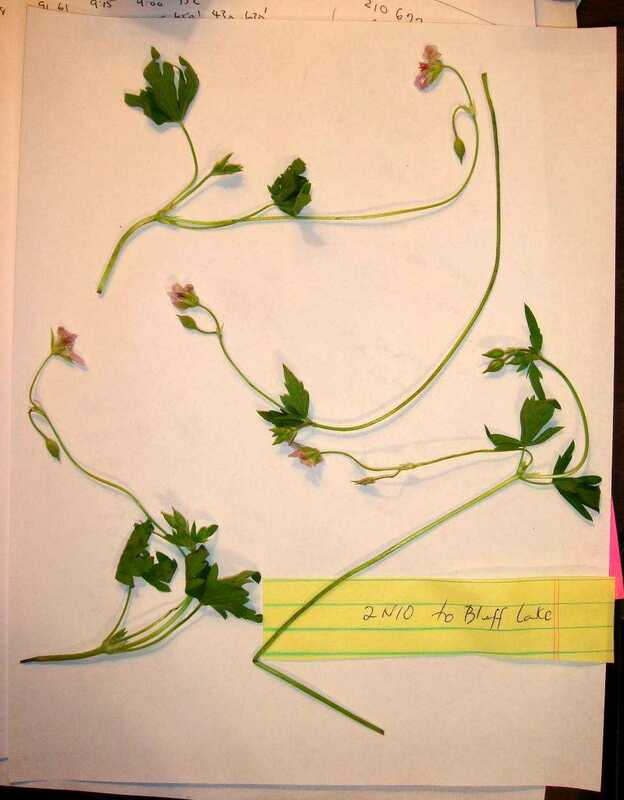 The single Bear Valley voucher determined as "G. richardsonii" should therefore be reexamined to see whether it is a compelling specimen of that species, or if it is also consistent with being G. californicum. 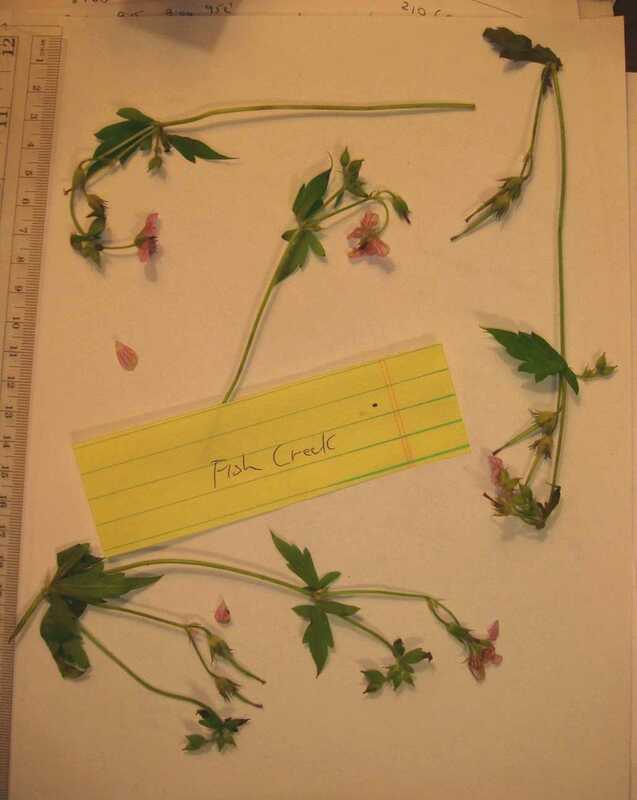 This page shows the specimens we have studied in Bear Valley, plots their locations, and compares them to a sample of the real G. richardsonii from Oregon. 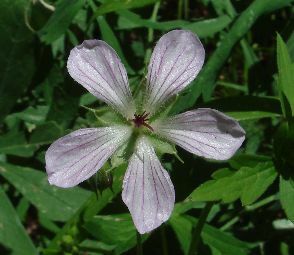 Geranium richardsonii was described in 1838 from a specimen in the Canadian Rocky Mountains. It is a very widespread taxon, occurring from northwestern Canada near Alaska, through the Rocky Mountains to southern New Mexico and westward to the Sierra Nevada. The heaviest concentration of vouchers plotted by Aedo 2001 is along the spine of the Rocky Mountains. Plants from the San Bernardino Mountains at 7000 to 8000 feet were called G. caespitosum in Jepson 1925. G. caespitosum was described in 1823 from the Rocky Mountains in New Mexico. Munz 1935 considered these plants as part of G. richardsonii, but Munz 1959 made them separate again as G. concinnum. Plants from the mountains of southern California to the Sierra Nevada were called G. incisum in Jepson 1925. Munz 1935 doesn't even mention this name. G. incisum was defined originally in 1842 (as a variety of G. hookerianum) from the Rocky Mountains and Oregon. Jones and Jones defined two names in 1943 for these plants. The name G. californicum was defined using the type specimen of G. leucanthum, and the name G. concinnum was defined from a Tulare County specimen. Munz 1959 used both of these names, reserving G. concinnum for the plants from the San Bernardino Mountains at 7000 to 8000 feet, with G. californicum now being fairly widespread in southern California, with essentially the identical geographic range in area and elevation in California as G. richardsonii. Munz 1974 combined those two names into G. californicum, and again this species shared essentially the same range with G. richardsonii. Native per (esp G. californicum, G. richardsonii) vary regionally, are often difficult to separate, need further study. Ah! A breath of fresh air finally! (;-) Could it be that there is only one species in southern California, and the difficulties were due to trying to make two species out of one? 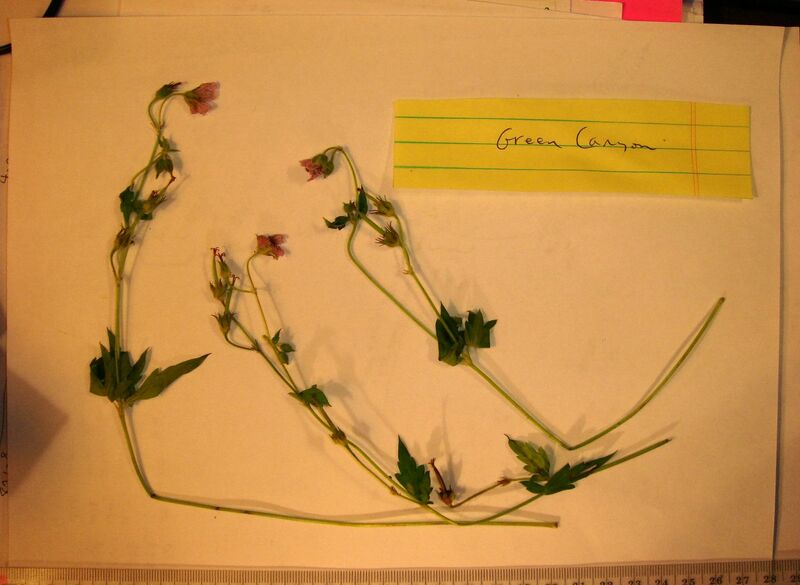 Fortunately, Carlos Aedo did that further study in his 2001 monograph The Genus Geranium In North America. II. Perennial Species, in Anales Jard. Bot. Madrid 59(1): 3-65, available online. To our knowledge, Aedo annotated 20 vouchers from southern California, 19 as G. californicum and only a single voucher as G. richardsonii. We could not determine if Aedo annotated other vouchers, since most vouchers do not have annotation information available online. Only UC/JEPS has that crucial information online, for some vouchers but not all. However, we suspect none of the vouchers from southern California herbaria were annotated by Aedo. Duplicates of some vouchers Aedo annotated to G. californicum still are listed as being determined as G. richardsonii at RSA/POM, and none of the UCR vouchers were annotated by Aedo (Sanders, personal communication). This strange separation of determinations by institution is in fact how we were alerted to Aedo's changes. The ten UC/JEPS vouchers for the San Jacinto Mountains are all determined as G. californicum, and listed as being recently determined by Aedo, whereas nine of the RSA/POM vouchers are determined as G. richardsonii, with only two determined as G. californicum. The single voucher from southern California determined as G. richardsonii by Aedo is from Bear Valley in the San Bernardino Mountains. 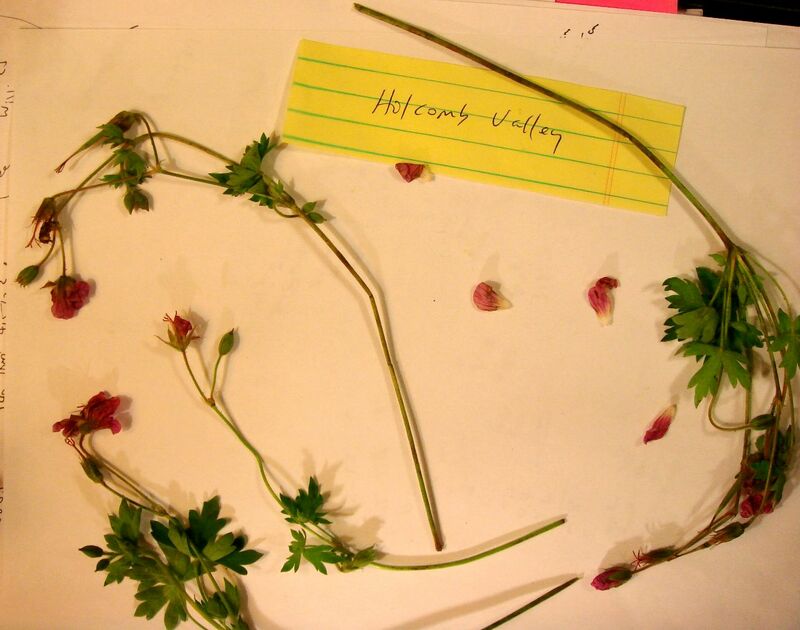 However, there are four other vouchers from Bear Valley and nearby locations determined by Aedo as G. californicum. Thus either the two species coexist in that single location in southern California, or else the single voucher determined as G. richardsonii was one of the hard to determine vouchers, and is actually G. californicum. To investigate this issue, we searched six different locations in Bear Valley and nearby locations for any specimen of G. richardsonii. This page shows the specimens we have studied in the Bear Valley area, and plots their locations. 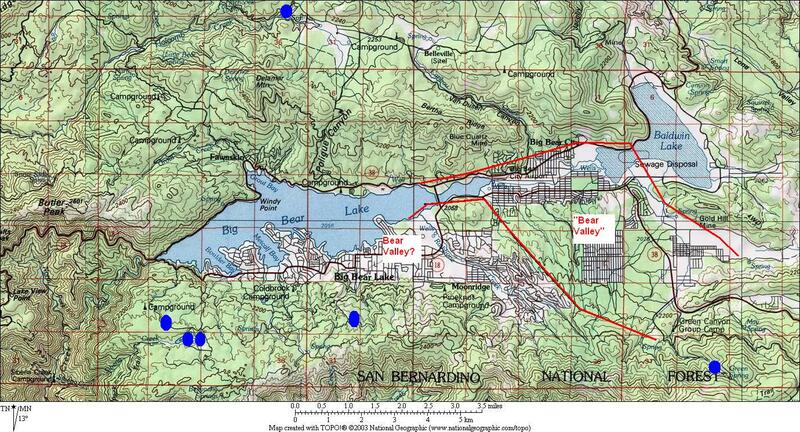 The following map shows the San Bernardino Mountains, along with locations of vouchers with known positions. All of these plotted vouchers are determined as G. californicum, either by Aedo or by using Aedo's key. The first two are determined by Aedo as G. californicum; the last one is determined by Aedo as G. richardsonii. 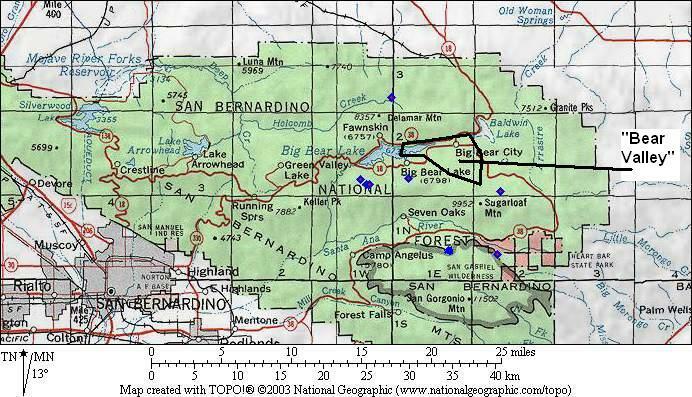 The area identified as Bear Valley in the current USGS topographic map is labeled in the above map. Most of that area is now urbanized, precluding further investigation of that area for native plants. 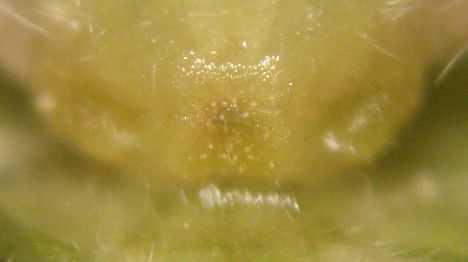 The primary distinction is on whether the nectaries found at the base of each sepal are glabrous (without hairs) or are lanate (woolly; densely covered with long tangled hairs). To my knowledge, Aedo was the first person to recognize this key trait to distinguish these species. The secondary distinction is the color of the petals, but that only works for plants with pink petals, which are G. californicum. Plants with white petals can be either species. Every one of our specimens had nectaries that were either glabrous, or had just a few scattered hairs. None had anything approaching a mass of woolly hairs. 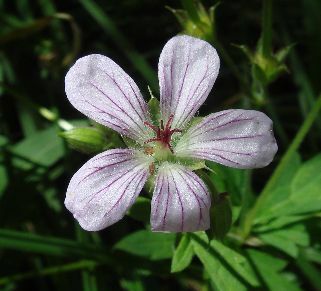 Because we were unable to locate any specimen in southern California that corresponded to Aedo's concept of Geranium richardsonii, we sent queries to people who lived in locations north of southern California, in an attempt to get a fresh sample of a real Geranium richardsonii. Fortunately, Sean Smith was able to send us a sample from Oregon, outside the range of G. californicum, which is a California endemic. The moment we saw Sean's plant we were struck at the difference between our plants in southern California and Sean's plant. Sean's plant was much more robust, larger in most characteristics, just as given in the Aedo descriptions. Best of all, the nectaries were lanate! 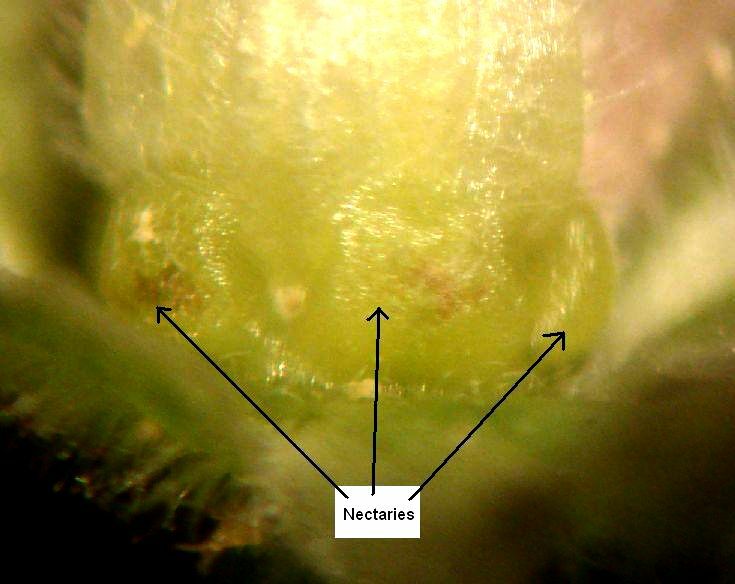 The following pictures show the nectaries of plants from the other locations we sampled. None of them even faintly resemble the nectaries of the Oregon plant. Our nectaries do not show the tuft of hairs at the top that are illustrated for G. californicum in Aedo 2001. 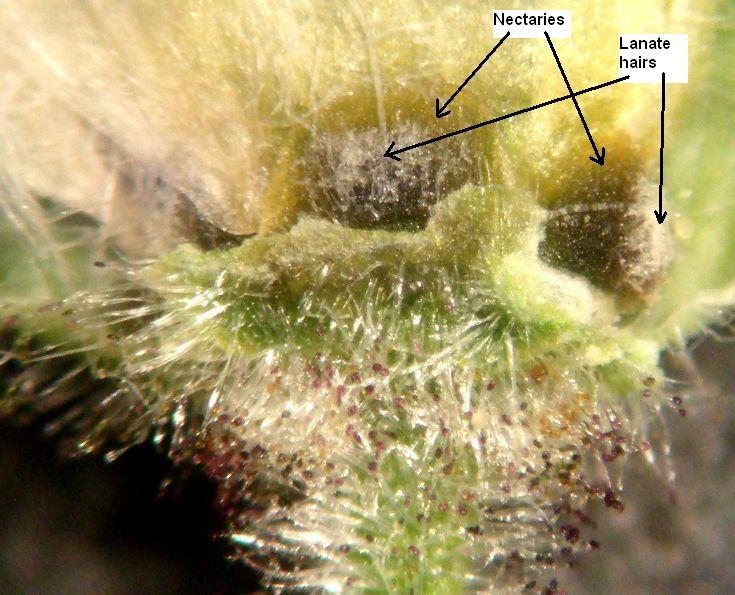 Similar hairs are found on the floral parts just above the nectaries, as seen best in the picture of the Holcomb Valley plant above. 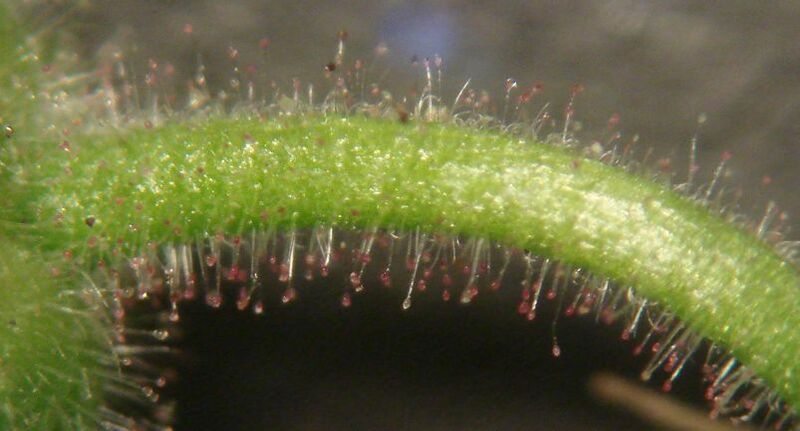 Either the southern California plants do not have the same tuft of hairs as illustrated in Aedo 2001, or the process of pressing and drying has made it appear that the hairs originate at the top of the nectaries. 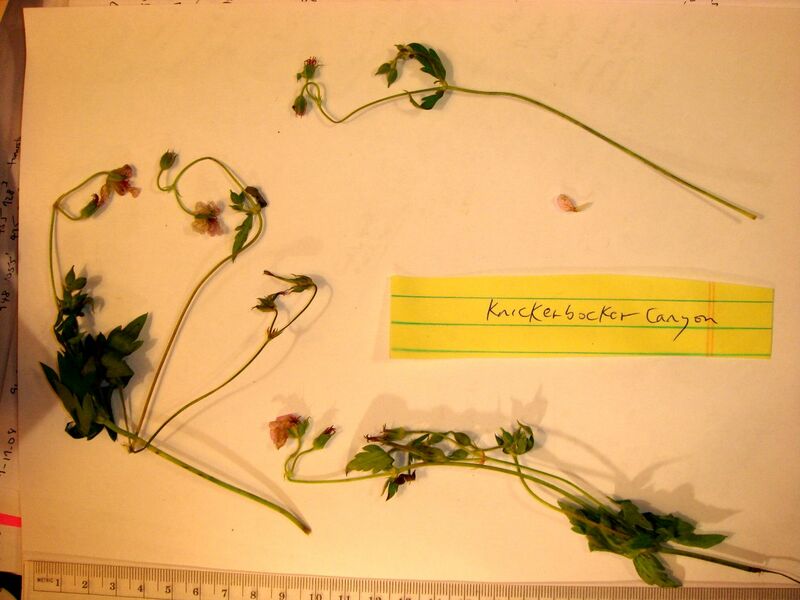 Here are pictures of the vouchers of the plants whose nectaries were shown above: Bluff Lake, Fish Creek, Green Canyon, Holcomb Valley, and Knickerbocker Canyon. Yet Aedo does not even mention the pedicel gland color at all in his monograph! The apparent reason is that the color of the glands is useless to discriminate the two species, as shown by the following pictures. Note that there are plenty of reddish glands in the top two pictures above of G. californicum from San Jacinto Mountain, similar to the reddish-purple glands of G. richardsonii from Oregon in the last picture. There are also some glands that are colorless. 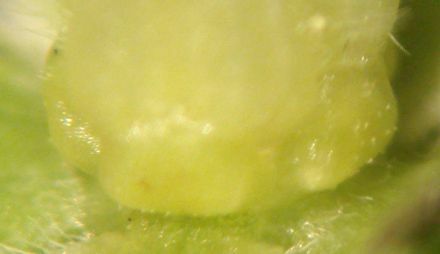 The next to last picture above shows white glands on a pedicel in fruit. We have seen similar white glands on pedicels in flower. The color of the glands is variable in G. californicum, with some specimens having both colors simultaneously, which probably accounts for the difficulty in determining many of the specimens from southern California. Data provided by the participants of the Consortium of California Herbaria (ucjeps.berkeley.edu/consortium/). We thank UC for putting annotation information for their vouchers online. We thank Sean Smith for providing us with an example of the real G. richardsonii, which was critical to understanding the difference between these species.